A first man is seen on a YouTube screen. He is dropping two objects, one from each hand. Man on screen: We'll check tablet build quality with our drop test. A curly-haired woman and a second man are viewing the screen. Second man: He's dropping them at different angles. The next panel shows the same view, but the man on the screen is now holding an object in each hand. The one in his right hand appears damaged. 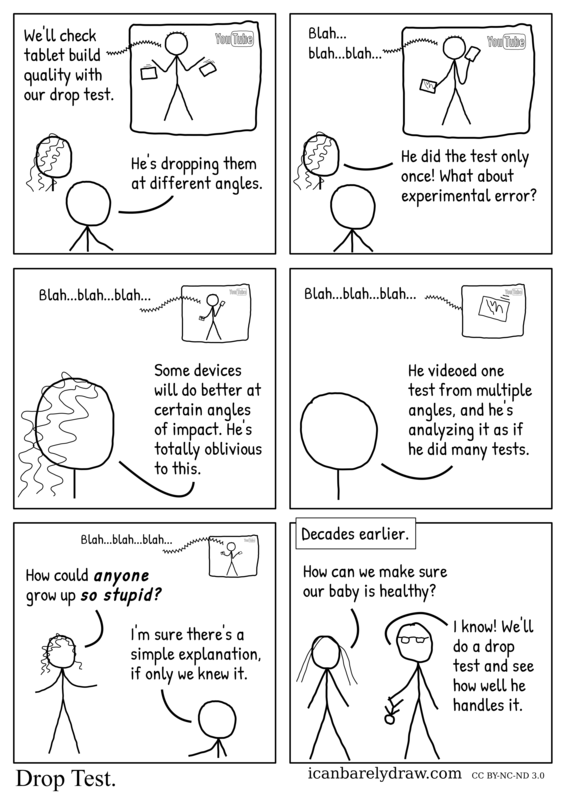 Curly-haired woman: He did the test only once! What about experimental error? The next panel shows the man on the screen in a smaller view and the woman in a closer view. Curly-haired woman: Some devices will do better at certain angles of impact. He's totally oblivious to this. In the next panel the screen shows a damaged object apparently moving through the air. The second man is seen in a closer view. Second man: He videoed one test from multiple angles, and he's analyzing it as if he did many tests. The next panel shows the man on the screen again, holding objects in his hands. Woman: How could anybody grow up so stupid? Second man: I'm sure there's a simple explanation, if only we knew it. The next and final panel shows a woman and a man, entirely different people from the ones seen so far. The woman has long straight hair. The man wears eyeglasses. In his hand he dangles an infant, holding it by the ankle, head down. Straight-haired woman: How can we make sure our baby is healthy? Man with eyeglasses: I know! We'll do a drop test and see how well he handles it.